Horror of horrors, the original British version of the Time Team television show has been axed. Cue plenty of ‘buried’ jokes by the media. The show has been cancelled after a solid 20 years of bringing archaeological excavations and investigations to the public. The show will continue with a new already filmed series which will be shown in 2013, but it has not been recommissioned for any other series after that, although one-off specials may be shown after this time. There have been several well publicized problems during the latter series of Time Team, with a lack of focus on the archaeology itself and problems with presenters helping to drive the viewers away. Although many professional archaeologists may gripe about Time Team and it’s misrepresentations about the archaeological sector, there is no doubt that it helped popularize archaeology and heritage on a large scale to a wide audience. Fear not though restless viewer, although Time Team may have gone the way of Extreme Archaeology, the ever present Tim Taylor is currently devising new historical programs as we speak. His statement regarding Time Team’s demise can be read here, whilst Francis Pryor’s can be read here. Meanwhile I recently took part in an archaeological dig as part of the Heritage Lottery Funded ‘Limestone Landscapes Partnership‘. The large scale project is based on the Magnesian Limestone plateau that runs from near the Tyne down to the Tees, and from the coast to central Durham, in north eastern England. The aims are to help conserve and record the landscapes, wildlife, and rich heritage of the Magnesian Limestone whilst ‘enabling communities to learn about, enjoy and celebrate their local area’ . I may be biased but this is an area of intense beauty, where the harsh realities of man’s industrial strength is matched only by the savage beauty of nature herself. 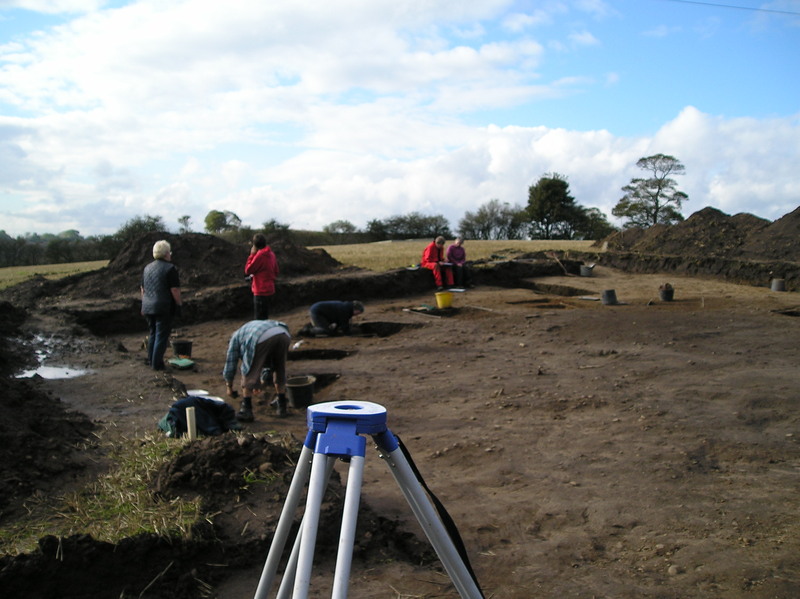 There are a wide range of projects available as a part of the program, and Community Archaeology is one such aspect of this. 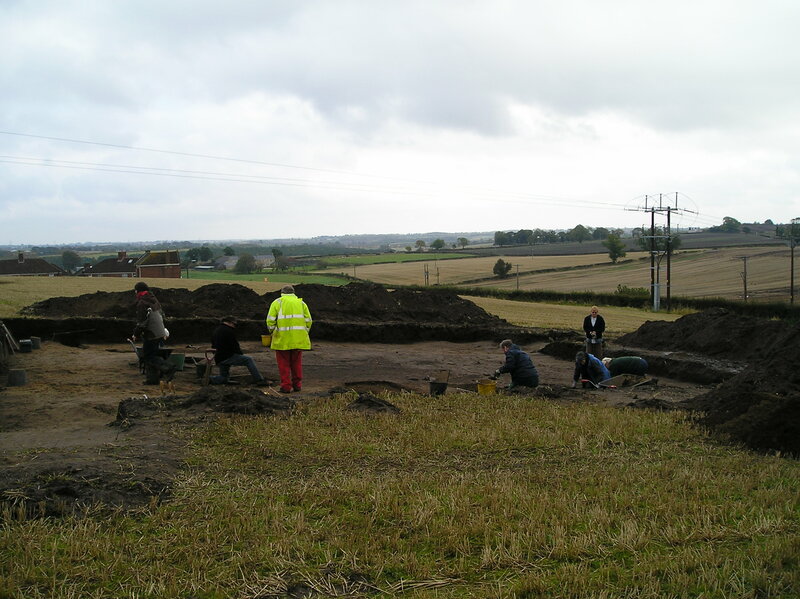 Carried out under the direction of the Durham University Archaeological Services and volunteer members from the Architectural and Archaeology Society of Durham and Northumberland, the two week dig at Great Chilton seeks to investigate an Iron Age enclosure site. Previous geophysical survey results had shown possible roundhouses, gullies and one or two boundary ditches; in other words a typical north eastern Iron Age settlement! Approaching the Iron Age site at Great Chilton, with the rolling hills of County Durham in the background. As I’ve stated before on this blog, I can’t contain my joy at being back out on site, even if it was just for the day. Unfortunately for yours truly, the site is difficult to get to if you do not drive (although I am rectifying that situation), and as such I will not be able to attend the 2nd week of the excavation next week. Walking across the field, with the short stubs of wheat being crushed underfoot, felt wonderful as the view of the spoil heaps loomed into view. The sun managed to break through the morning mist as the day was set to be spent close to mother earth. My task for the day was to excavate and help define a part of the ditch surrounding one of the Iron Age roundhouses in the first trench. Although nothing of note was recorded it was a joy to be able to get stuck into the sandy soil and to take in the fresh October air. Can you spot the Iron Age round house? 50% sampling method of the outside ditch, where at meter intervals 1x1m square patches were uncovered and excavated down to define said ditch. Community archaeology is on something of a high note at the moment as various projects around the country are including the local and not-so-local volunteers, whilst many archaeological units are including the local populace with engaging in the local heritage scenes. I firmly believe that without volunteers archaeology would, in some respects, grind to a halt. At Great Chilton I was re-united with a fellow digger who I had first met some time ago, on a similar Iron Age/Romano-British site in my hometown, and with who I have visited a few other sites since. As the familiar clink of the WHS 4 inch pointing trowels filled the air I thought that this would probably be the last dig of the season, before the snows of winter appear. Although I haven’t dug much this year I have felt grateful for the opportunities when I have had the opportunity to do so, and had once again enjoyed joining the extended family of archaeologists that toil away at sites throughout the country. The next blog entry will concern the human foot as the final part of the skeletal anatomy that will be covered for the Skeletal Series entries.